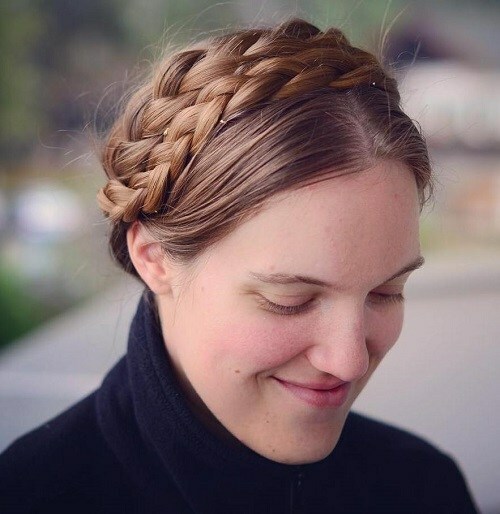 If you’re a keen follower of fashion, or even if you just have an eye for things that look beautiful, it’s very likely that you’re familiar with milkmaid braids. Braids are about as trendy as it gets in 2018 and with summer upon us, up-do plaited styles such as milkmaid braids are only going to become bigger and more beloved. With so many options out there; goddess braids, fishtail braids, French braids etc, you might be wondering why you should opt for milkmaid braids. Well, the answer is simple. 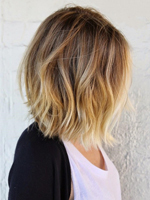 This is one of the prettiest ways to show off your creative character, look absolutely stunning and, of course, keep your long locks up and out of your face in a way that’s super convenient for the summer time sunshine. We believe that milkmaid braids look stunning on just about every girl, so we’ve found 20 of the most elegant examples of this classic, chic style to get you inspired. Keep on reading to find out more. 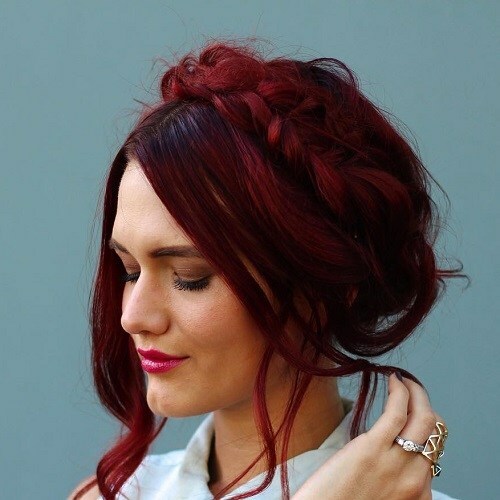 Keep cool and stunning this summer by trying out this look which makes the most of two huge braid trends. Not only does it show off some soft and elegant milkmaid braids, they have also been styled in a fishtail style. This combination goes together perfectly, especially with those loose, wavy strands which have been pulled out to the frame the face. 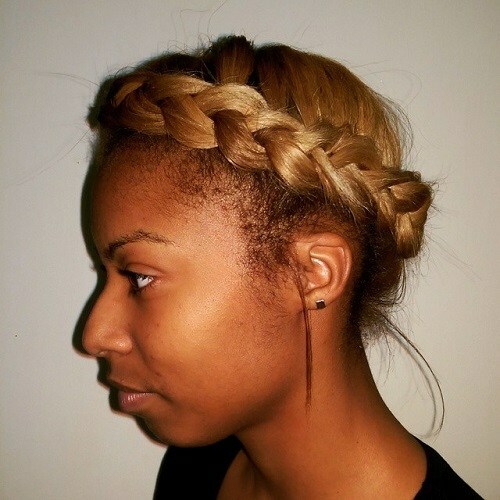 Here is another way to incorporate the fishtail style into your milkmaid up-do. This one is slightly scruffier and has a thick crown of chunky fishtail braids which make the model’s blonde locks look absolutely jaw-dropping. There aren’t many up-dos which show off ombre as beautifully as milkmaid braids. This romantic and very thick plait is ideal for flaunting the glossy golden brown highlights in the length of the model’s thick, flowing hair. Sometimes you want an understated look which shows off your natural beauty in a simple way. 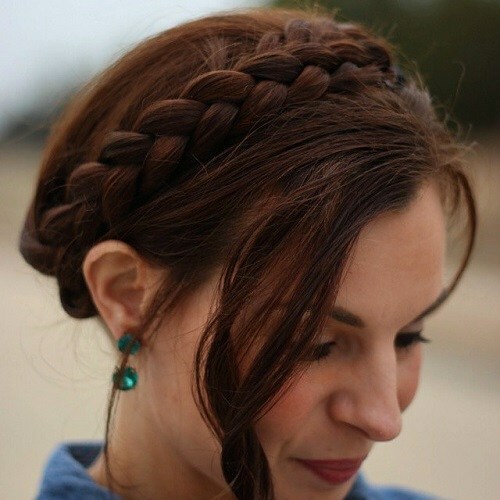 This thin milkmaid braid with long wavy strands does exactly that. If you have naturally thin hair, this style of braid will especially suit you and will work wonders by adding texture and the illusion of thickness. Create all the shape and silhouette of a faux bob by styling your length into chunky, messy milkmaid braids and leave jaw length strands loose at the front. This is a wonderful way to keep your long locks under control during the hot summer season. Spice up your style by dying your hair a shimmering shade of fiery red like this. 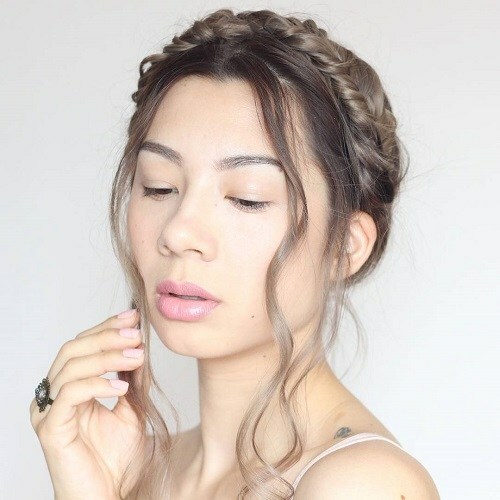 Such a striking warm tone looks stunning when worn up in a simple and loose milkmaid braid. 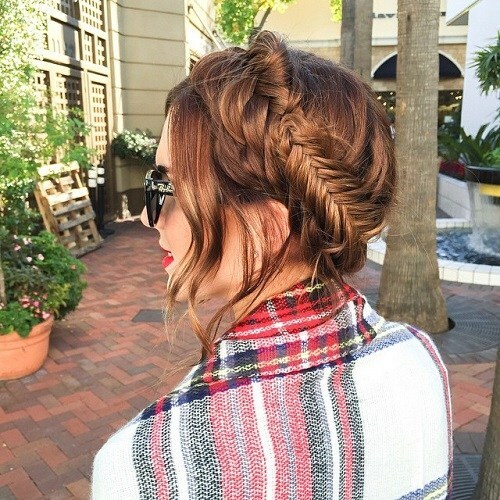 This thick fishtail braid has been loosely pinned up into a milkmaid style. The look is set off perfectly by the beautiful brown shade with some subtle caramel balayage and pretty, face framing waves. The great thing about this neat and tidy, auburn up-do is that it can be worn to just about any event. Whether you’re going out casually in the day time, attending a party or even looking for a chic, romantic hairstyle for your wedding, this look will be ideal. You can make your milkmaid braids look more beautiful and eye catching than ever before by experimenting with pastel rainbow shades. 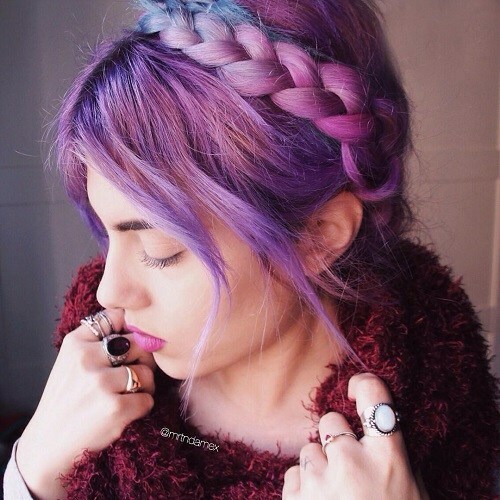 Faded tones of baby pink, purple and blue are about as magical and girly as it gets, especially when worn up in braids like these. Let out your inner bohemian babe by trying this hairstyle for yourself. The loose and stylishly scruffy way the braid has been pinned up with wavy strands at the front is about a hippy chic as it gets, and we love it. To really finish off this look, try out this deep shade of wine red which is complementary for all skin tones. 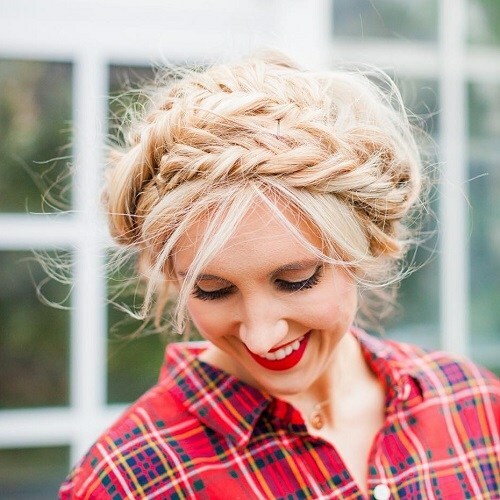 One of the most chic and classy ways to upgrade your milkmaid braids is to simply double it up. 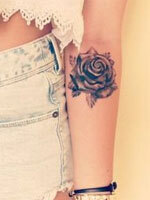 As well as looking stunning, this style is sleek and pretty. The two braids together make the model’s reddish brown hair look thicker and fuller than ever. This totally traditional hairstyle is how the medieval milkmaids of northern Europe would have worn their hair when the look first originated. 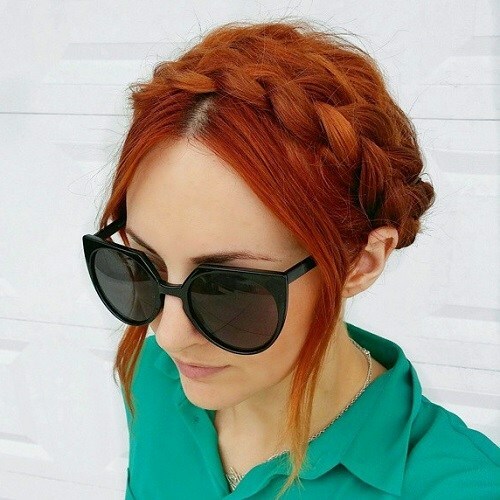 Wear it neat, tidy and slightly pushed back with a centre parting if you’d like to recreate this demure braided style. We especially love the make-up free face and naturally colored hair. 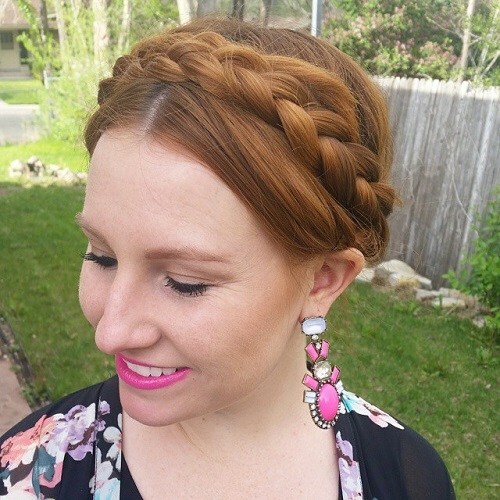 Even if you have a relatively short bob, you can still rock some beautiful milkmaid braids. 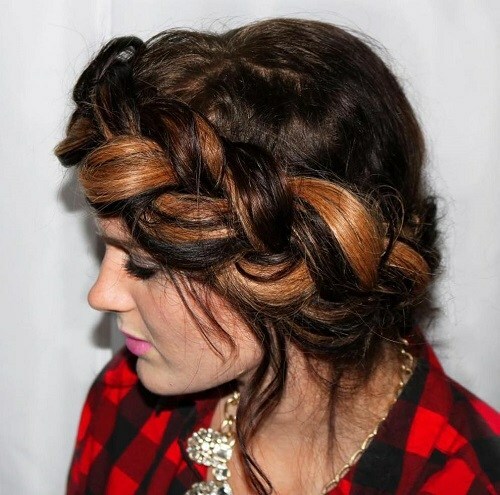 This effect can be achieved by incorporating a thin, twisting head scarf into the braid. 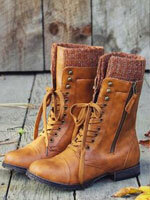 You will look chic and totally unique when you accessorize with this quirky addition. These twin milkmaid braids, worn in a sculpted crown effect, are about as sleek as it gets. You might need to spend a little bit of time perfecting the plaits to make sure that there is not a hair out of place, but the final results are well worth it. 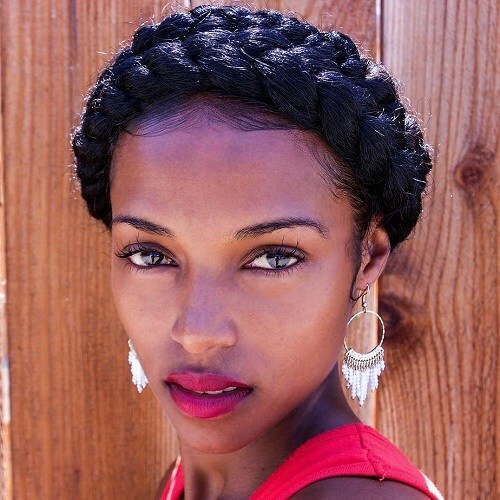 Slick down the baby hairs around your edges to make the hairstyle look even more polished. Looking for a beautifully elegant hairstyle which requires very little effort and hassle? If so, this single, simple milkmaid braid is the perfect look for you. As if this wasn’t pretty enough, that shade of golden blonde looks amazing paired with the model’s brown skin. 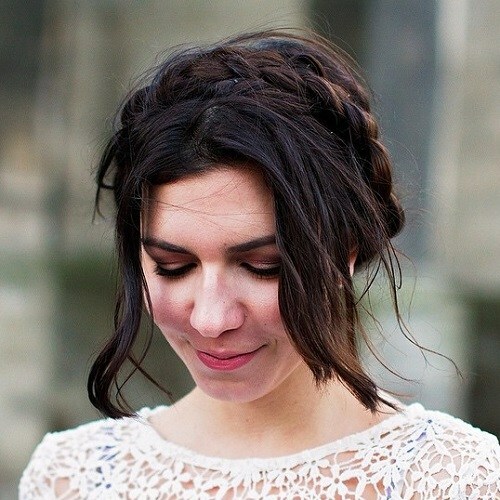 Add a personal touch to your milkmaid braids by mixing and matching braid styles. One fishtail braid and one traditional, ordinary braid pinned right next to each other not only look fun, they add a lot of texture and definition to the hair. Flaunt your angelic side by wearing your milkmaid braids in a halo style around the entire crown of your head. 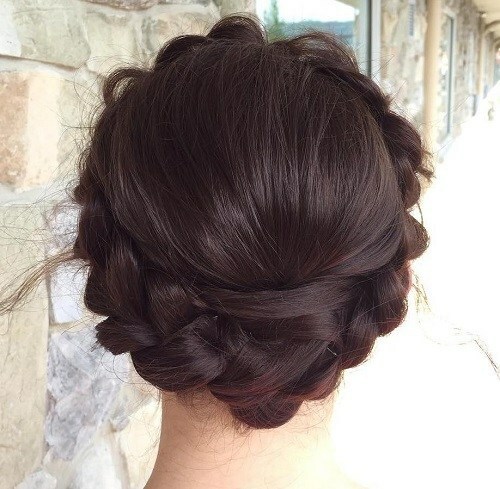 Milkmaid braids usually stop at the sides or bottom, but this rich chocolate brown example steps it up a gear by going the whole way around. French braids are all the rage right now. 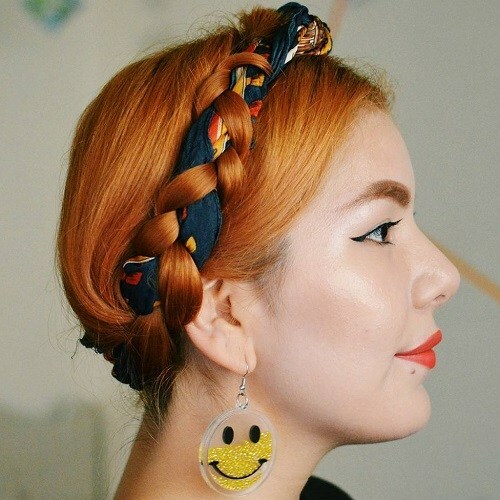 If you can’t get enough of these fancy plaits, but want to wear your hair up and away from your face, why not incorporate them into your milkmaid braids? 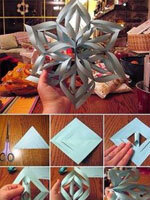 This style is surprisingly simple to achieve and the effects are truly beautiful. Here is another look which shows off just how simple and sweet traditional milkmaid braids can look. There are no elaborate embellishments or frilly details going on in this hairstyle, but it is still incredibly elegant and flattering for just about any face shape. We can’t think of a more flattering way to frame you gorgeous facial features than this hairstyle. 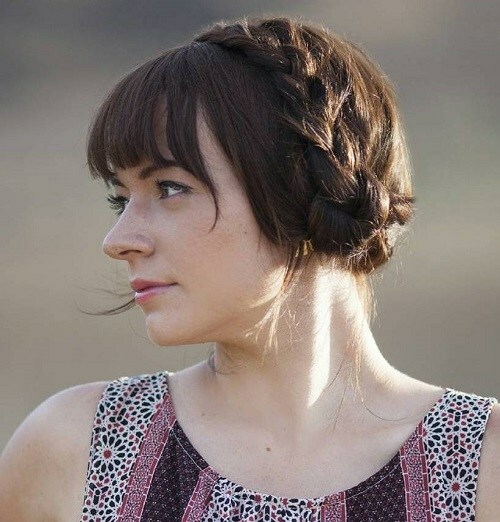 Full, thick bangs and an elegant crown of milkmaid braids go absolutely perfectly together and are a guaranteed way to get plenty of heads turning your way.